Choose either the 6-panel, 8-panel, or 10-panel style of these Accordion cards. The 6-panel card has 3 images on each side and comes in two finished sizes – 5×5 or 5×7. 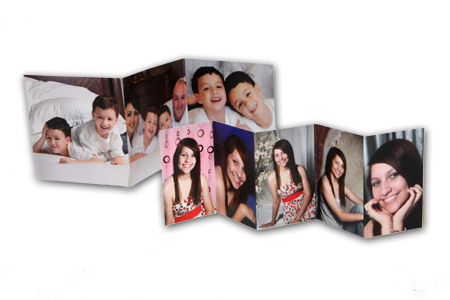 The 8-panel card has 4 vertical images on each side and comes in a 3.5×5 finished size. The 10-panel card has 5 vertical images on each side and comes in a 4×12½ finished size. Available in Matte and Semi-Gloss paper. Accordion Cards come in quantities of two.